Research has shown that we are wiping out insects so fast, we are putting our future at risk. Worldwide, over 40% of all insects are declining, and a third are endangered - a quarter of insects could be wiped out within just a decade. This will have a massive effect on all other species, and also our crops and plants which rely on insects for pollination. Habitat loss, insecticides and climate change are the main culprits. 1. Go organic – in your garden and in your shopping. Diverse planting, healthy soil, natural habitats and no toxic chemicals are good for everyone, including insects. 2. See here for how to encourage beneficial insects into your garden, and here for interesting facts on our favourite insects. 3. Help with further insect research. Scientists at CEH (Centre for Ecology and Hydrology) are asking gardeners to take part in an insect watch. Visit website for more information on how to add to their existing data. It requires no more than sitting in your garden for 10 minutes, recording insect life around you. Ash dieback - how can we help in Rattery? Ash dieback has already reached Rattery, with some road-side trees scheduled for felling shortly. Ash dieback in the UK is likely to lead to the extinction or decline of over 50 species which are reliant on or highly associated with this tree, including mosses, lichens and beetles, according to a recent study. The researchers recommend that, safety permitting, the ash trees are not felled but left to die naturally, to be replaced with mixtures of trees which support similar woodland species, such as beech, sycamore and oak. At a time when biodiversity is increasingly under threat, even without ash dieback, and given how long it takes a tree to mature, there is an urgent need to start a replacement programme now. The Environment Advisory Group is continuing to look for a suitable site for establishing a community woodland, which would include these species. Any help/suggestions welcomed! In the meantime, the following gives advice on recommended actions and responsibilities. Devon, as a county, has over 20% of its tree coverage made up of Ash Fraxinus excelsior whilst nationally it is only 8% . Devon County Council has seen an increase in the pathogen Hymenoscyphus fraxineus, or Ash dieback, across the County in the last few years with the mortality rate, due to this disease, being predicted as high as 90% from this tree pathogen outbreak. The Forestry Commission explains the pathogen in detail with photo’s indicating how to spot the effects on Ash trees . Devon Highways highlight that a duty of care exists to all landowners with trees in their ownership. This means that landowners are responsible for trees on their land and are also responsible for the safety of people who come into contact with them. The pathogen can compromise the structural integrity of Ash trees and render them as structurally weakened and dangerous within a few years of becoming infected. We recommend that landowners have privately owned trees monitored on a regular basis and all works identified are undertaken. All privately owned trees will need to have ongoing inspections to make sure trees are without significant defects, diseases and pathogens that will not result in trees failing. Devon Highways will not inspect privately owned trees in the future, however they have increased their inspection regime from three yearly to two yearly to reflect the current speed of decline caused by this pathogen. I think I have found an ash tree that is infected who do I report it to? The fungus causing Chalara dieback of ash is classed as a quarantine organism so any suspected sighting should be reported. You can do this via the Forestry Commission’s Tree Alert, their online reporting tool. My ash trees are infected. What should I do? Once the infection has been confirmed you do not need to take any action unless you are issued with a Statutory Plant Health Notice by the Forestry Commission or other plant health authority. This will then explain what you need to do. As the disease progresses monitor the trees and take any actions to ensure they remain safe. We would not recommend pre-emptive felling of mature ash trees. These can live for a long time with Chalara, and even if much of their wood is dead they are good habitat for wildlife (and it’s crucial to keep the odd tree which can tolerate the infection). Who pays for the felling of ash trees if they are infected? The cost of felling lies with the tree owner, so in this example you would need to pay. But we don’t necessarily advise felling. Safety permitting, trees should be left, as they provide valuable deadwood habitat for many smaller species of wildlife. Can infected wood be used for timber or fuel? There is a low risk of the disease spreading via infected logs. If the site is covered by a Statutory Plant Health Notice movement of ash firewood or timber from the site is prohibited. Ash logs or firewood may only be moved off infected sites with permission from the Forestry Commission. Ash wood may, however, be used on site as fuel. Can ash leaves be used for composting? If leaves are from a tree free from infection they can continue to be composted and disposed of using existing local authority arrangements. Leaves from infected trees or trees suspected of being infected however should not be removed from the site, so do not put them in green waste bins for composting, for example, as this risks spreading the disease. Forestry Commission advice in this situation is that burning them on site is the best option. I have an ash tree in my garden. What can I do to prevent infection? There is no cure and once trees are infected with Chalara dieback of ash it is usually fatal. The disease is spread through spores released from fungal bodies on fallen leaves, so collecting and burning those may help reduce repeat infections. If the disease is already in trees nearby this is unlikely to have much impact as the spores are carried in the wind. There is little we can do to halt its spread and the full impact of the disease is still an unknown. To protect your tree for as long as possible, monitor it for signs and report any suspect tree, follow biosecurity precautions and don’t move seeds, twigs, leaves or other plant material from site to site. You can help scientists with crucial information as to how nature is responding to climate change. It’s fun, easy and anyone can take part. Just go to: Naturescalendar.woodlandtrust.org.uk/getrecording and record the familiar signs of the seasons near to you. E.g. spotting the first frogspawn, arriving swallows, ripe blackberries etc. 4Ocean have identified 15 ways reduce plastic consumption to help create a more hopeful future for the fate of our oceans. 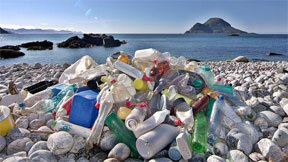 Go to 4Ocean website to find out how. Rattery celebrated the opening of The Kettlewell Walk, a new permissive footpath in the heart of the village, on the morning of Saturday 6 October 2018. 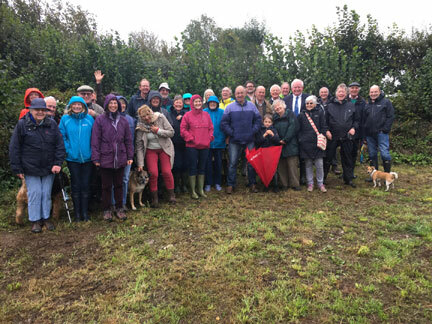 The Chairman of Rattery Parish Council, Richard Haigh, welcomed everyone braving the rain to attend the ceremony and invited County Councillor, Richard Hosking, to cut the ribbon to open the Walk. Councillor Hosking told the assembled parishioners and guests that the project was a brilliant example of what could be achieved by co-operation and community action. The new path was made possible by the generous permission of various landowners, including Devon and Cornwall Housing and, in particular, Dartington Hall Estate. Dartington Hall Chief Executive, Rhodri Samuel, joined the group walking the path for the first time. He commented that he was delighted to see further evidence of the productive partnership between Dartington Hall Estate and the Rattery community. 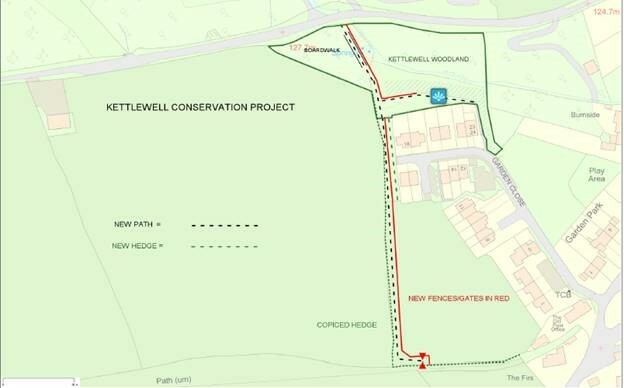 Cllr Haigh explained that collaboration with Dartington Hall had given the Parish Council better control of the village playing field, help and advice with wildlife conservation, a clear way forward for management of the Kettlewell woodland, as well as the new permissive path. The Kettlewell Walk is named after the area (by the lower part of the walk) which was the source of water for the village before the arrival of mains water as late as 1949. 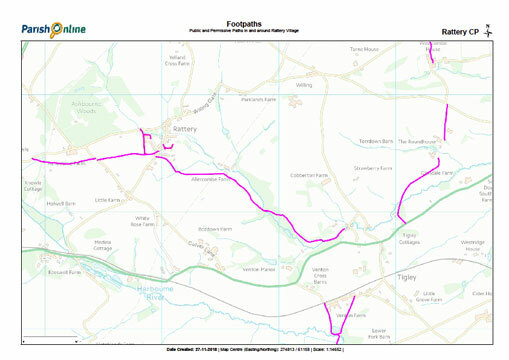 The Walk extends and connects existing footpaths to create a longer off-road network stretching across the parish. The scheme was financed by a grant from the National Grid Community Fund and forms part of a conservation project led by the Rattery Environment Group. This is a new charity devoted to conservation in the parish. Chairperson of the Group, Kim Howard, thanked all the volunteers and organisations, including Totnes Young Farmers, who had helped bring the plan to fruition. She explained that the project will preserve and enhance an area of woodland and wetland and the hedgerow corridor that links it to other wildlife areas along the valley of the Bidwell Brook. The parish is home to 13 species of bat, and an internationally important roost for Greater Horseshoe Bats, so the maintenance of corridors that serve as flight paths is a very high priority. The project has so far included additional fencing, gates, ground clearing and the cutting back of some overgrown hedgerow, to stimulate regeneration. The area will be traditionally managed to provide a good environment for many species, including the local dormice. Click here for information about joining the group or helping with conservation work. Click here to comment on your thoughts/experience of the Kettlewell walk plus any wildlife sightings. There are several public footpaths and unmetalled roads (which resemble Green Lanes) within the parish. Please follow the Country Code and keep dogs under control when livestock is present. Dog owners are asked in the interests of hygiene to clear up after their pets & put it in the bin provided outside the public footpath opposite the village green (church/pub) carpark. Our volunteer Parish Paths Co-ordinator is always glad of volunteers to help with the upkeep of the paths: To contact the paths coordinator please telephone the Clerk 01364 644109. Just a quick reminder that now would be a good time to start giving supplementary food to any visiting hedgehogs you may be fortunate to have. This will help to ensure they reach the 650g weight needed to successfully hibernate. It’s especially important this year, as they will be struggling to find food and water in this extremely dry weather. Give good quality cat or dog meat and/or cat biscuits (kibble/crunchies). Feed in the evening in a large shallow dish. Don’t start digging up things in the garden for the hog to have "its natural diet", as they may contain things that could kill it. The diet detailed above is perfectly healthy for them, but please don't give ‘treats’ (e.g. fairy cakes, digestive biscuits, fruit and scrambled eggs); whilst these are often recommended on the web, they are not good for them. Also do not feed mealworms, peanuts or sunflower hearts, as they are high in phosphorus and low in calcium, which leads to metabolic bone disease (causing fractures etc.). Sultanas/raisins/currants get stuck on their back teeth and cause tooth decay, so avoid giving them. And of course, never give bread or milk, but do leave a shallow bowl with plenty of water – hogs need a lot. “The Rattery Environment Group (a registered charity) promotes the betterment of the local environment and leisure time facilities. It enables new projects by researching possible new developments, putting together project proposals, negotiating with interested parties and applying for grants, as necessary. The remit of the Environment Advisory Group (EAG) is to advise the Parish Council on the delivery of the relevant sections of the Parish Plan. This includes organising community action arising from projects instigated by the Rattery Environment Group)”. Volunteers for the groups are always welcome. Contact them on: environment@ratteryvillage.co.uk. To offer an interface between parishioners and the Parish Council on matters relating to the nature conservation and public open spaces. Liaise with other bodies, in particular with the Rattery Environment Group charity. Provide information for parishioners on nature/environmental matters. Although every care is taken in the presentation of information contained on this web site we cannot be held accountable for any inaccurate information supplied. Please inform webmaster of any errors found on this site.